Wal-Mart Stores has internally announced a new merchandising services program that narrows to five companies able to manage supplier displays and other services in more than 4,600 Walmart U.S. stores. Everyone else is out of luck. In-store merchandisers are an army of mostly hourly contract workers who set up and check on supplier displays in Walmart U.S. stores. But more third-party companies have emerged in recent years and the number of merchandisers in stores haven’t necessary followed the same protocols. 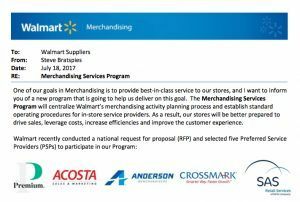 Steve Bratspies, chief merchandising officer for Walmart U.S., noted new guidelines for its “Merchandising Services Program” in a July 18 memo to suppliers and obtained by Talk Business & Politics. Bratspies said the retailer is centralizing the merchandising activity planning process and establishing standard operating procedures that follow the retailer’s “one best way” agenda. He said the effort will allow stores to be better prepared to drive sales, while also leveraging costs and increasing efficiencies that can improve shopper experiences. The retailer recently conducted a national request for proposal regarding the new protocol and a more centralized system. The new protocol will cover tasks such as modular resets and display installation, seasonal program execution, point-of-sale placements, new item cut-ins, stocking and availability. Wal-Mart selected five Preferred Services Providers (PSP) to be part of the new program. The companies winning approval to continue working in Wal-Mart stores are: Anderson Merchandisers, Crossmark, Acosta, Premium and SAS Retail Services. That leaves dozens of other third-party merchandisers out of the loop. The new protocol begins Sept. 1 and the retailer said other third party merchandisers have until Jan.1, 2018 to fully transition out of the business. Beginning Feb. 1, Bratspies said only the preferred service providers will be authorized and approved to perform merchandising services in Wal-Mart’s stores on behalf of the retailer or its suppliers. Bratspies was clear that suppliers are not required to participate in the new program, but if suppliers intend to use in-store merchandising services it must be one of the five companies approved by Wal-Mart. He said suppliers who use in-store merchandising must enter a master service agreement and adhere to statements of work that must come from one of the approved the providers. The retail giant said it will establish program guidelines with its approved partners which includes service costs. He said suppliers needing in-store merchandising will be able to contract directly with one of the five providers and negotiate their rates within the range set by Wal-Mart. Bratspies said the five companies it chose to be preferred service providers will operate a Wal-Mart specific service model in which trained and certified representatives perform work exclusively in Wal-Mart stores on behalf of its suppliers. In other words, merchandisers at Wal-Mart will not be able to take other assignments at competitors of the retail giant. “The Program will benefit Walmart and our Suppliers by enabling better coordination with stores, improving the quality and consistency of the work being performed by representatives and enabling our store associates to more effectively complete activities and better serve the needs of our customers,” Bratspies noted in the memo. Advantage Solutions will continue doing business with Wal-Mart by handling its in-store retailtainment services and product demos on behalf of Wal Mart’s marketing team, he said. Bratspies said suppliers that employ merchandisers in-house will still be authorized to perform those services at Walmart but first they must fully comply with the new protocol which includes, knowing and following the retailer’s best practices guidelines and obtaining certification and validation of the retailer’s new digital platform. He said Wal-Mart’s merchandising services department will work with such suppliers on a phase implementation plan. He also said Sam’s Club is not included the scope of the new program guidelines but if a club wants to use one of the five approved in-store merchandise providers it may do so as it’s own discretion. Walmart U.S. CEO Greg Foran has been focused on improving store performance among his U.S. fleet for the past two years, He’s been a driving force for the retailer’s “one best way” practice which executives said recently encompassed every aspect of store operations. Judith McKenna, chief operations officer said the retailer had to decide to change everything, or nothing at all and it has been a huge undertaking over the past 18 months but nearly every process associated with store operations have been changed in some way to reflect the retailer’s “one best way” approach. The agenda handed down by Bratspies appears to be an extension of the “best way” down to the army of in-store merchandisers who work on behalf of suppliers and occasionally Wal-Mart. While the streamlining of this process allows for more centralized control by Wal-Mart, not everyone agrees it will be beneficial for the smaller suppliers of retail. 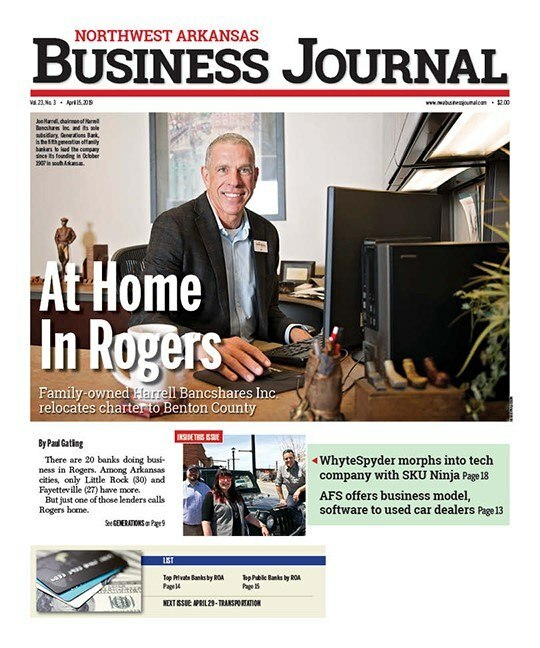 Peggy Knight, a supplier consultant and former Wal-Mart executive, told Talk Business & Politics there could be unintended consequences for smaller suppliers with the new agenda. She said in most cases smaller suppliers with one product in Wal-Mart don’t have the financial ability to hire larger merchandisers like Acosta or Crossmark and have in the past relied on local consultants and service providers to do that work on their behalf. She said the costs of the new “On Time In Full” delivery requirements which kick into full gear Aug. 1, new charges last year for products going through a warehouse, and Wal-Mart getting the lowest possible prices was already pressuring margins for some suppliers. Knight understands Wal-Mart wanting to ensure its stores are efficient, but layering costs on everything from merchandising, to shipping and slotting and distribution expenses will squeeze out many small vendors. Knight said one company she counseled in recent years was in more than 1,000 stores with their product, but keeping tabs on that product was a challenge because they could see in Retail Link there might be no sales in 100 stores where they knew product was received. She said in those cases smaller suppliers can hire Fayetteville-based Field Agent to look at 100 stores and report back their findings. In one case she said there was no product on the shelves in dozens of stores. While Field Agent can verify a problem, it takes in-store merchandisers or someone else to fix it, she said. This company opted to hire an offshore call service to phone the stores and ask them to move the product from the backroom out to the floor. “Of course they have no way to really know when or if that will happen,” she said. Knight also said Wal-Mart’s assortment could suffer as it will be harder for some regional and local vendors to profitably do business with Wal-Mart.